Welcome to NM Collector Software. For $30, you receive a full featured software package that enables you to keep track of any type of collection you may have. Primarily, I would imagine that Knives and Guns will be the draw here...I am using and reviewing the Knife Collector Software. There are a few pre-loaded collection templates that come with the software, but fear not...if you want a way to keep track of your Garbage Can Lid collection, you can make your own template for that as well. But for now, let's stick with the Knives. First of all, I had done some research on the abilities of this program, thinking I had to buy each collector package separately. Not so. One program held ALL the available collector templates, and I could use them all! So, my purchase did not limit me to only one collection, but all available templates, and the ability to make my own. Very handy! Then it came to installation. As it turned out, it is not so much an installation, as a Plug-and-Play program. Plop it onto your hard drive where you want it, and go. No tedious installation needed. No big deal, you say? Well, with this type of program, you may now toss it on a USB stick on your key-chain, and carry it around in your pocket...and be able to run it on *any* computer you come across. Your whole collection on your key ring! Handy again, no? Also, if you use a Cloud service, you can plop it in your Cloud, and be able to access it from anywhere as well, if you don't like packing a thumb drive around. Same result...your collection and inventory is now available at your fingertips from any system with internet access. Just log onto your Cloud and run the program! Tell me you've never wanted to have your whole collection in your pocket for shows, shopping, or just hanging out with fellow collectors! Colour me impressed thus far...and we haven't even used it yet. So...it's where I want it, ready to go...let's fire this puppy up! A little more comprehensive, and more what I was looking for. Editing the names of the fields was simplicity, once the little Edit Captions button was checked. Not bad at all...and a minimum of frustration. Now I have a good start. Again, filling in the fields with my own info was quite easy, once I edited them to show what *I* wanted. On to the next page...Description. That's more like it! Very easy, now that I have a clue as to what I am doing. Certainly more suited to what I want, and how I want to organise things. The Pictures tab is very basic to use. Click Add, find photo on your computer, click on it, bang...it is copied to your program database...*not* just a link to a picture on your computer. This now allows you to have all your pictures of your knives available on your USB drive, or your Cloud service, and accessible from anywhere! You can add as many as you like for each knife entry, and you can choose which photos to include when you print a report, if you find the need to keep a paper record for yourself, or if you are giving a copy to your insurance company, or locking a copy in the safe with your collection. From what I can tell, the only limitation on photos is how big or small you want your database to be. You can also make comments on your photo and add any relevant information you like. 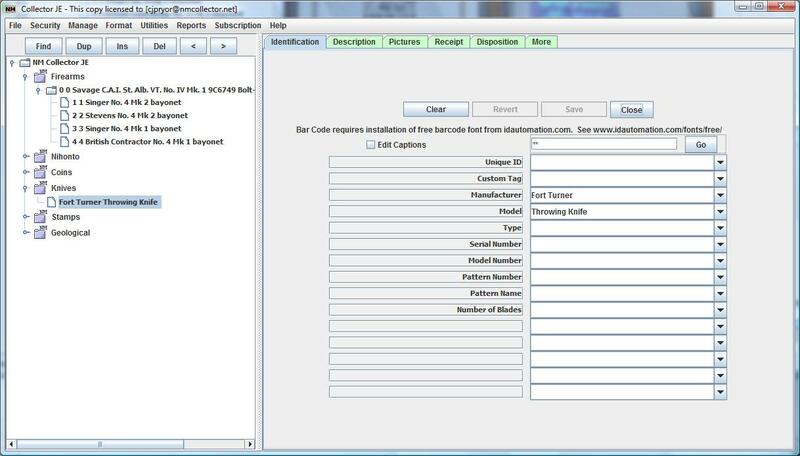 Next up are the Receipt and Disposition tabs, which document your purchase or sale information...where, when, who, address of seller/buyer and any notes you wish to include. Great info to have if you track your buyers and sellers. These I didn't bother to change. The next tab, Maintenance, was nice to see. Here you can track your cleaning, repairs, warranty work etc., and keep track of the costs, dates and tasks for each individual knife. Most, I imagine, will ignore this tab for the most part, but others will find it quite handy to track any work done on specific knives. Again...fields can be changed to your preference. The next tabs are fairly self explanatory. The Events tab, I assume, is for any shows or events related to your particular knife entry...either selling or buying. Dates, costs, employees etc. The More tab is looking like a place to add more fields that wouldn't fit on other tabs. Again, customisable...an example of one I just threw together. Overall, it seems like a fantastic program that can be used to be as descriptive and as comprehensive as you choose to be, with the ability to use it in a very basic capacity if you so choose. Fairly flexible in its uses, easy to use once you get things set up the way you want them. 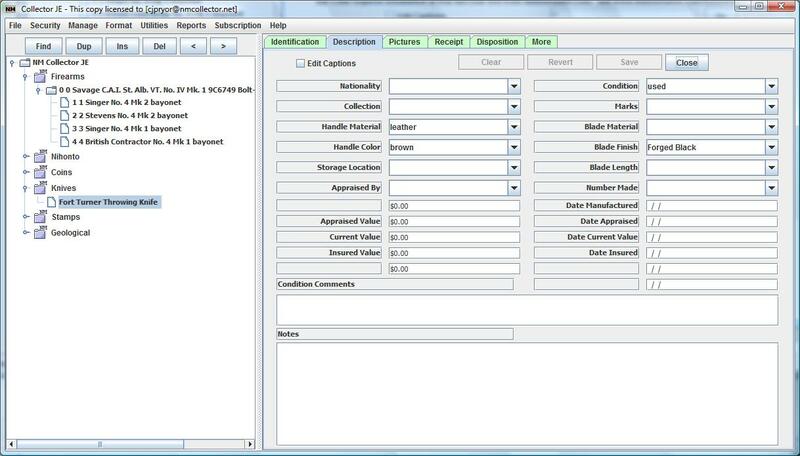 It also allows you to print out a few different styles of reports, depending on what you need. With or without pictures or notes...how many photos to include...that kind of thing. So...there you have it. 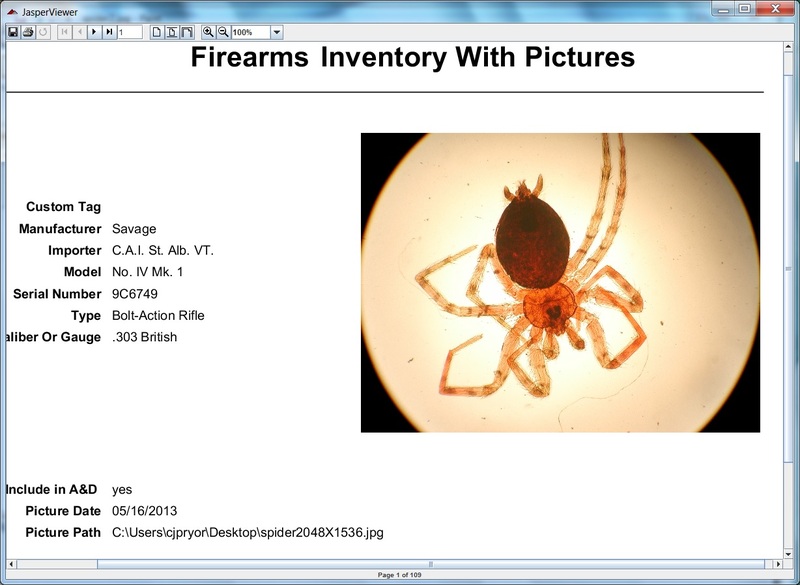 So far, the best program I have seen yet for inventorying your collection. I'd say a 7/10 on ease of use, 8/10 for usability and practical usage, however, that may well go up once I figure out how to delete or change existing fields in the tabs. For that, I have sent a support request, and am waiting for an answer back. I can't seem to delete Date or Money fields, although I can change the description of them. A minor issue at best, but one I would like to learn how to do. It will be a daunting task, entering all my knives into this program, and taking pictures in a format that will be constant with all my entries, but once the collection is entered in its entirety, it will be a piece of cake to keep it current with any new purchases or sales I may make. As this program doesn't keep info on servers on the internet, once you have it, you can use it forever. It won't be discontinued and made unusable, you can use it for life. And for the price, I think it is a fantastic deal. It also has an App that will let you carry all this info on your phone or tables, and will sync with your computer if you make changes on either your computer or device. And for $2.03, the App is well worth the buy. $32.03 for your entire collection in your pocket with all your info and as many pictures as you want, usable on any computer anywhere, and as basic or detailed as you choose, PLUS being able to have the same thing for *anything* you collect? I say Great Deal! Feel free to check out the program for free for 30 days of full features, and judge for yourself. You can find it Here ...I hope you find it as useful as I have so far. Please let me know if I missed anything, or if you have any questions. I'll try my best to answer them, or find the answers for you. And if you do purchase this program, I would be happy to help you get going with it. Looks like something we all need. I plan on getting it this year. Manx, do you have to renew the program every year or once you purchase it, it is yours? My licence is a Lifetime licence. Best I can see, once you have it registered and activated, it's all yours. I like the software but I am having trouble getting photos to work. I have tried it on two computers and had the same problem. It seemed to work OK for the first three or four knives I entered in it. But after adding a couple more it quit working. I'm not giving up yet. I may delete it and start over and see how it works. Hi, Clay Pryor here. I am the author of NM Collector Software. Can you tell me more about the problem? What does it do when it quits working? How big are your pictures? It can hang up due to memory limitations if the pictures are too big. Not knowing anything else about the problem, you might want to consider not storing pictures in the database - you can set the program to just use the pictures in your file system (rather than storing them in your database) by selecting Options > Pictures > Store in File System. You can find more information in the on-line user manual. Yes, that is correct. Thanks. Great review! Thank you very much. One thing to note is that once you go through and customize a collection template to your liking you can export the template for others to import so they can take advantage of your hard work. Here is a link showing how to export a collection template (this happens to be on a Mac but the process is the same for all types of computers): http://www.nmcollectorsoftware.com/examples/Mac_Export_Collection_T.... I'm sorry I don't have an example for importing but it's just a matter of clicking the import button and following the instructions for someone else to import your collection template into their software. When I have more time I will read your review in detail. Hopefully you don't mind if I link to this review from my pages. I don't mind at all. Glad to have you with us, Clay. I think it's awesome to see a developer backing his software like this! Making a house-call to address issues folks have is certainly a step above what most companies would do. Kudos! So...with the photo issue. Is there a maximum size for pictures? I know I'd like to use the highest quality pictures I can, especially if using this for insurance purposes. Aside from keeping pictures on your computer, is there a way to use hi-res photos *and* keep them in the database? Thanks :) It's a passion of mine - sort of like a hobby. There really isn't a limitation on picture size from NM Collector's perspective but it does load all of the pictures for a particular item into memory so you can run low on memory which will cause problems for the program. Also, it will make the database larger than it has to be if you store lots of pictures in it. Also, it is an efficient use of your file system because the picture takes up space on your file system and then again in the database which takes up space on your file system. That is one good reason to not store pictures in the database. Anyway, as an experiment, I encourage you to download the high resolution image in the article below and then load it into your copy of NM Collector software. Once loaded, play with the image buttons to see what you get. I think most people will find that they won't need as high resolution as them might initially think. 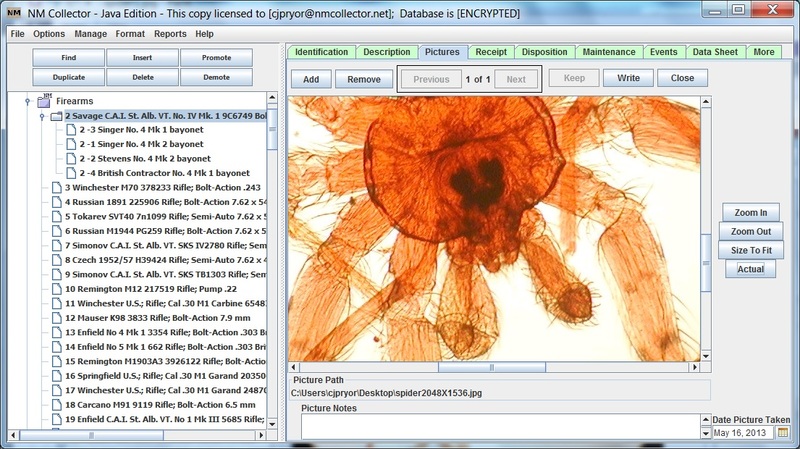 Here is an interesting article discussing image resolution and file size: http://www.microscope-microscope.org/imaging/image-resolution.htm. It is interesting to note in that article that their example of a very high resolution image ( 2048X1536 [3.1 megapixels] ) is 536 KB in size (please see actual picture below)! This is the 536 KB image from the article above. 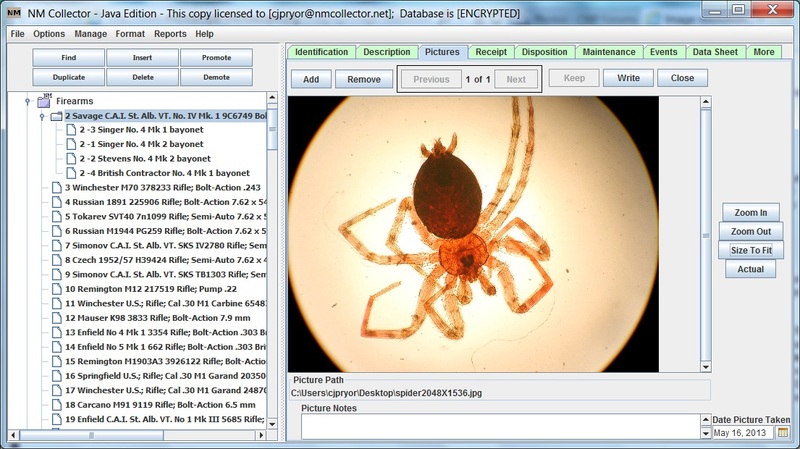 (http://www.microscope-microscope.org/images/spider2048X1536.jpg) The forum software and most web browsers will resize the image to fit your screen so to get the most appreciation out of it you might want to download it and view it full size on your computer with your favorite image editing software.